Fast-paced technological advances in the field of healthcare have proved pivotal in the development of personalized medical solutions. What seemed impossible just a couple of years ago has become a reality in today’s high-tech world. Both public and private healthcare establishments are using innovative technologies, such as 3D scanning, to diagnose and treat their patients, as well as create tailored medical aids to significantly increase their quality of life. Anatomik Modeling is a company that has expertise in designing and developing 3D custom-made implants. The mission of the business is to deliver personalized healthcare 3D solutions that are a perfect fit for the anatomy of each patient and that are suitable for low invasive treatment of pathologies such as congenital thoracic deformities, which are anomalies in the growth of the chest wall. Some examples of these deformities include pectus excavatum, which is an excessive growth of the cartilage that joins the ribs to the breastbone and causes a concave defect of the sternum, and Poland syndrome, which causes an underdeveloped chest muscle on one side of the body. Benjamin Moreno, Anatomik Modeling’s CTO and co-founder believes that personalized healthcare and custom-made medical devices provide necessary treatment and solutions to patients for whom traditional medical devices are not suitable. Customized medical devices can cater to a number of complex anatomy cases, produce better results and significantly reduce the duration of surgery and recovery time. In particular, Benjamin and his team of professionals are using Artec 3D scanning solutions along with Geomagic Freeform software to design flawless customized chest implants and monitor results. The current workflow is as follows: Before the operation, the patient undergoes several scanning sessions to gather the required data on the deformity. Artec 3D scanners are used to capture the information of the patient’s chest on the outside, while a CT scan is performed to see the internal structure of the patient’s rib-cage. Then, to design a customized implant, data from the patient’s CT scan is directly imported into the Geomagic Freeform software in a standard file format, such as STL or OBJ. This advanced 3D software is ideal for designing and manufacturing organic shapes, particularly since it can be used with a haptic device – a sculpting tool that gives users the physical sensation of sculpting in a virtual environment. “Freeform is used to design the medical devices to fit the patient’s anatomy impeccably. This is the perfect software to do this because all our medical devices have organic shapes. Of course, we use the Phantom Haptic device that lets us manipulate and sculpt the medical devices in a completely freeform way! It saves us a lot of design time.” commentsBenjamin Moreno. Once the design is finalized, a prototype is produced using CNC machining. The prototype is then casted in plaster to create a mould. Medical-grade silicone is poured into the plaster mould to form the implant. This method is used since there are no current 3D printing technologies available that would be able to print medical silicone elastomers that are of medical-grade quality. The custom-made 3D implant is then surgically inserted deep inside the chest, in-between the rib-cage and the pectoralis muscles, an Artec Eva 3D scanner is used to capture the new shape of the thorax. The detailed 3D pre-operation and post-operation scans from 3D scanning sessions are then aligned, and distance map comparisons are performed directly in the Artec Studio scanning and processing software. 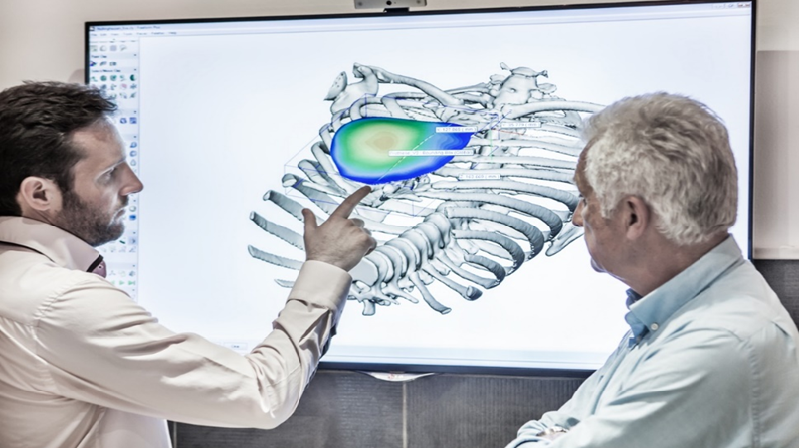 This gives a clear depiction of where and how body tissues are projected – the 3D models allow the experts to better understand how the soft tissues on top of the implants are repositioning themselves according to the standard anatomical structure of the rib-cage. The current workflow is straightforward, fast, safe and easy. However, this wasn’t always the case. Before implementing Artec 3D scanning solutions, Anatomik Modeling used other, more conventional methods to gather the required data for analysis, such as plaster casting or CT scans. Plaster casting is very time consuming, while CT scans can only be performed while the patient is lying down, rather than standing. As a result, the soft tissues move, making the captured data inaccurate. To obtain 3D data in a fast, precise and safe manner, the company first acquired an Artec MH 3D and an Artec EVA. MH and EVA were the perfect portable solutions for capturing data for thorax deformities analysis. Later, the company also bought an Artec Spider for scanning the faces and heads of patients with extra-high resolution. Now, both pre-op and post-op patients can easily be 3D scanned while in a standing position, ensuring precise results each time. Furthermore, even though CT scans are still necessary to create a customized implant, patients’ exposure to harmful x-rays is now significantly reduced. “Using the Artec EVA and Spider VS classic plaster molding saves a lot of time and is much more reliable. Thus, it is much easier for the patient, compared to when plaster is used for molding. Also, having the 3D models of the patient’s anatomy allows you to take measurements that would be impossible to attain using the plaster molds.” Benjamin Moreno, Anatomik Modeling CTO, and Co-founder. The integration of professional 3D hardware and software has proven to be a great success and is significantly improving the lives of many people for the better. With ever more upcoming projects and constant developments in the 3D field, advanced 3D technologies are paving the way forward for the personalized healthcare industry, both for the Anatomik Modeling professionals and for healthcare experts worldwide.